So, what is Rimac Concept_One? For starters, Rimac is a "technology company for petrol heads, by petrol heads". Rimac Automobili was founded in 2009 by Mate Rimac, an Austrian entrepreneur ( I would not attempt to pronounce it correctly lest my tongue be twisted). He idolises his compatriot Nikola Tesla and read a lot on him during his childhood. So when his BMW had a blown engine, inspiration seeped in from his early days. He decided to replace the BMW's engine with an electric powertrain. When he figured out that he neither had the money nor a taste for existing systems, he set out to make one for himself. In the process of making his custom electric powertrain, he had as many as 24 innovations and patented them. From battery to motors, his team developed them all. The concept was produced at a cost of $ 980,000.The car debuted at the 2011 Frankfurt motor show. The production began in 2013. In 2016 it's design was slightly revised and showcased at Geneva Motor show. The production was limited to 8 models, thus sticking to its tag of being a 'concept'. Why is the car making waves in the industry? Rimac is widely considered as the first electric hypercar. It boasts a power output of 1224 HP (800 KW) and has a peak torque of 1600 Nm. It does 0-60 in 2.5 seconds and the top speed is electronically limited to 355 kmph. Don't rub your eyes, you read that right. With such specifications, it can cream almost any car that may cross paths with it. It has taken out some of the most celebrated names in the industry. La Ferrari, Porsche 918 and Bugatti Veyron 16.4 Grand sport got crushed by the giant slayer. Apparently, it can mince almost any of the Internal Combustion Engine (ICE) driven vehicles without any regard for their reputation. All hope is not lost, however. A Koenigsegg is yet to be pitted against the electric car. Considering the projected performance of Koenigsegg Regera, it should be able to outrun the Concept_one. 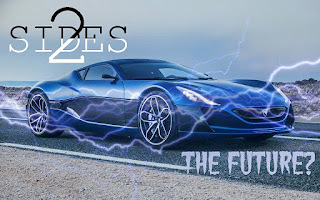 The battle between Rimac and his mentor, Christian von Koenigsegg, doesn't end so easily because Rimac promises that Concept_one's successor, the tentatively titled Concept_two, will be much more powerful and advanced. Elon Musk should be feeling warned. The race to dictate and dominate the electric car market may not be a cakewalk, after all. As we have no data on the successor of Concept_one, we have to stick to describing the concept_one. Each of the wheels gets a liquid-cooled permanent magnet synchronous electric motor. The wheels can be individually powered which means that it can be driven in a zillion modes as you wish. It is a technological paradise. You want to go skiing? Turn a knob and it becomes an AWD. In a mood to drift? Try RWD. The car also gets one of the most advanced torque vectoring systems that can control each of the wheel 100 times a second. The rear wheels get dual clutch transmission apiece. The motors are powered by a 90 kWh battery with a range of 350 km at conservative speeds. The car was most famously driven by The Grand Tour host Richard Hammond. He was taking part in a hill climb when he went off the cliff and nearly got killed. Miraculously, the only injury he sustained was a fractured knee. That accident is a glowing testimony to the fact that despite being a 'hypercar', it is one if the safest to drive around. In an interview with Drive Tribe, Hammond said that he loved the car and it's "properly ambitious" range. He commented that the all wheel torque vectoring system was "breathtaking". He also mentioned that he had to " invent some vocabulary" to describe the car and that the car felt modern and genuinely futuristic. His colleague Jeremy Clarkson also had some words of praise for the car. In a column for The Times, he called it "amazing and brilliant. We are not talking about a car that is as fast as an Aventador, but massively faster than that". James May termed the car an " Electric delicacy". As the car was of a customer's, Rimac has reportedly decided to build one to replace the car. However, if the stars align and you get your hands on one somehow, the headache of maintenance arises. Rimac has produced only a handful of cars till date.You will have to ship the car to Rimac 's only production centre or fly in the team of mechanics. The company is still nascent. The owners will have a hard time coping with comments, which are not necessarily sensible, like " You could have bought a Ferrari or a Lamborghini at that price!". Rimac is a company that has only 200 odd members in its workforce. If you happen to be a millionaire and you want to get a new ride, you would normally pull up to a dealership. In this case, you simply can't, because there isn't one. This is one of those situations where having cartloads of money won't help. Getting into the good books of Rimac should help you, however. While the car may not pollute our planet as much as its petroleum counterparts, It could give you some trouble finding a charging station.The car is too quiet. It can't boast about possessing that throaty roar of a combustion engine powered vehicle. The strength of this car is performance, so is it's Achilles heel. Concept_one can't sustain high power for a long period of time because of heating problems with its battery pack. That is one region where ICE cars have an upper hand. It will struggle a lot if it had to participate in a race other than the drag race format. The practicality of the car is extremely limited. It is not an everyday car. We can't drive a sub 3-second 0-60 car on traffic congested and dilapidated roads. Rimac is not known to be a track machine ; this could be partially because of it being so exclusive that even the top reviewers have a hard time getting to drive one. The car doesn't have a classy appearance. It doesn't command the attention like the more conventional cars. If by any chance you are offered a Rimac, don't think twice. Grab the opportunity with both hands. If that doesn't work out well, I bet you will more often than not find a buyer offering a higher price for the car. As for the Concept_two, we can only wait and watch as to what it will turn out to be.